This is a wonderful sign. It's in a cafe called Beans love Greens on Calvert Ave in Shoreditch. The simplicity of the 'strapline' is nice and I guess it was once above a newsagent in Hackney. These days I'm sceptical that these metal signs are real. I think it is, I hope it is. I've been listening to old Desert Island Discs recently, the other day it was Tim Martin the founder of Wetherspoons pubs. Surprisingly he talked about design quite a bit. He didn't actually talk about Design of course, but things that influence and affect the design of his pubs. He tries to visit a minimum of 15 pubs every week. He always parks at least 10 minutes away and walks to the pub. He likes to get a feel for the town that the pub is situated in. How the pub should feel in that town. I'm reminded of the Saarinen's advice, "Always design a thing by considering it in its next largest context". I've always thought lots of Wetherspoons pubs have quite different and location sensitive design. Not all of them, but enough to make me think about writing a blog post in the past. This will have to do now. When I was at the Co-op, one of the smartest decisions we made was to make the first choice shop fascia, no fascia. So when the sign fitter turns up to fit a refurb, the priority option is to put the logo directly onto the building. There are many examples where this wouldn't work and many good reasons why you wouldn't do this, but making it the first choice makes everyone stop and think about it. There are too many brightly coloured plastic fascias creating an aggressive tone to the high street but this small decision has resulted in some lovely sympathetic shop fronts. I bet that was more persuasive than anything the Remain campaign did. Anyway. 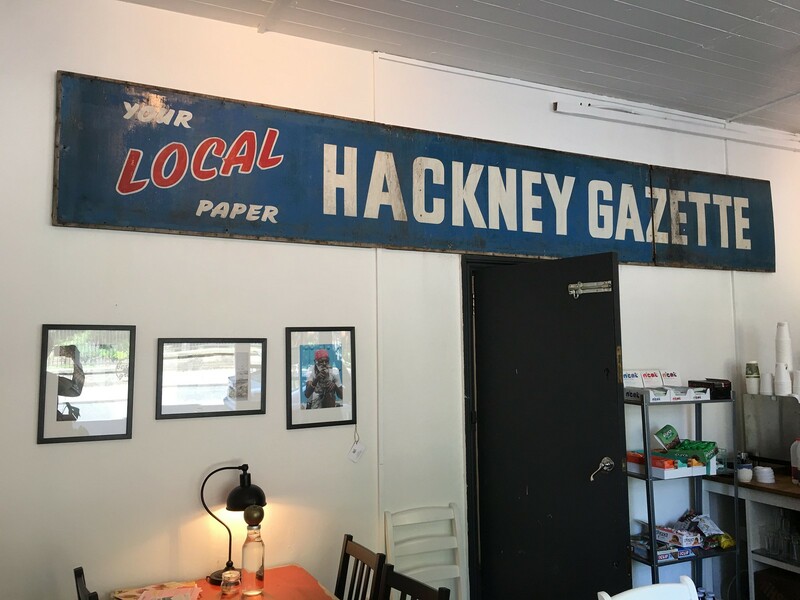 I hope that Hackney sign is real. I think it is. "There are too many brightly coloured plastic fascias creating an aggressive tone to the high street but this small decision has resulted in some lovely sympathetic shop fronts." This is really terrific, thanks for this post.